This post was prompted by Sue Marsh’s post about the Benefit Cap. You can read it here. This got me thinking, and two things (among MANY issues with this whole idea) stood out for me. That 26K would be the average household income for most households. So, to test both these theories I had to do a few calculations. I tell a lie, I hopped over to the awesome website turn2us.org.uk who are brilliant at telling you your benefit entitlement just by you plugging your details into their website. I came up with a partly-biographical-partly-hypothetical family and created a couple of scenarios. Scenario 1 – Married couple with 3 children. 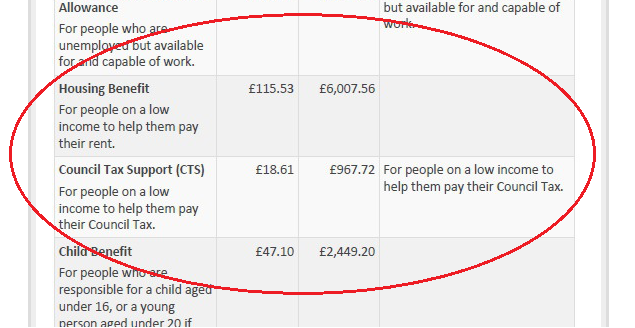 Both partners work 37 hours a week at £6.75 an hour (just over minimum wage) bringing our joint income to £26,000 (the “average income” figure from the government). No other earnings/savings/capital. Scenario 2 – Exactly the same as above, but with neither partner working. No income of any sort recorded in the calculation. 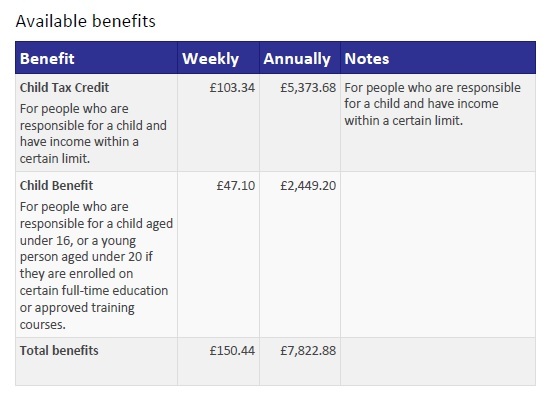 A benefit allowance of £7,822.88. Add that to the income of £26,000 and you get a total of £33,822.88. A benefit allowance of £23,992.28. Which is £9,830.60 lower than the first scenario. So, what does all this mean, really? Is this realistic? Possibly not entirely – the earned income is GROSS income for a start, so there will be some tax and NI to pay which will take it down a bit. But I think we can safely say that Sue’s thought that earning 26K would still get you additional benefits on top is clearly correct. – it gets you nearly £8,000 a year on top of your £26K. But, I think this hypothetical scenario raises some interesting questions. Firstly, is this morally right? The Tories are all about “making work pay” and there’s no denying that the working fictional family is definitely better off than the unemployed one. Is this a good thing? Does this mean that our fictional unemployed family should “get off the sofa and look for work?” Maybe. But, to me the really worrying thing is about the rest of this fictional family. Our three fictional children. Having our three fictional children has earned our non-working family an extra lump of cash, that’s for certain. But, the cap for benefits is set at 26K no matter how many children you have. This smacks of the “well, if you can’t afford ’em, don’t have ’em!” attitude but that doesn’t account for a massive amount of societal problems that cause people to have children they may not be able to afford. The lack of aspirations among young women who can only see themselves having kids as a future. 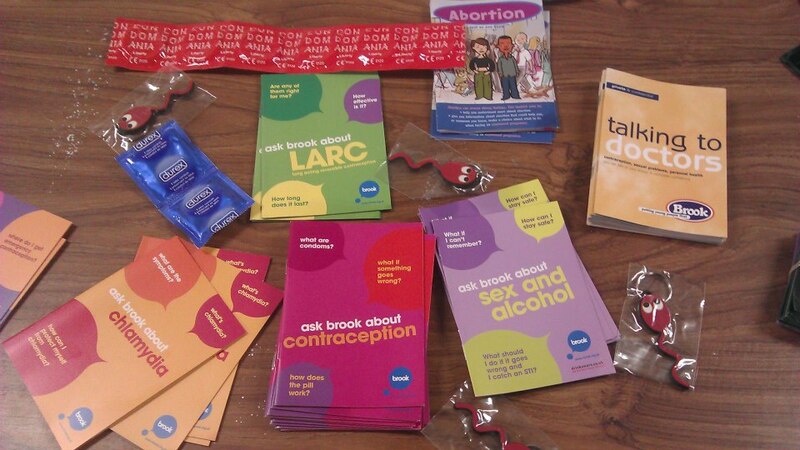 People who haven’t been educated enough in sexual health to take proper precautions to avoid unwanted pregnancy. The closure of sexual health clinics, youth projects, sexual health workers whose job it was to bring down the rate of unwanted pregnancy. I believe that you should not punish children for the actions of their parents. This policy of the benefit caps does exactly that. It is unethical, it will push more children into poverty and it will punish children for the acts of their parents, and punish parents for not being able to access resources they need. The policy is a punishment, not an incentive, and only does more to push the vulnerable further into poverty. It needs to go. 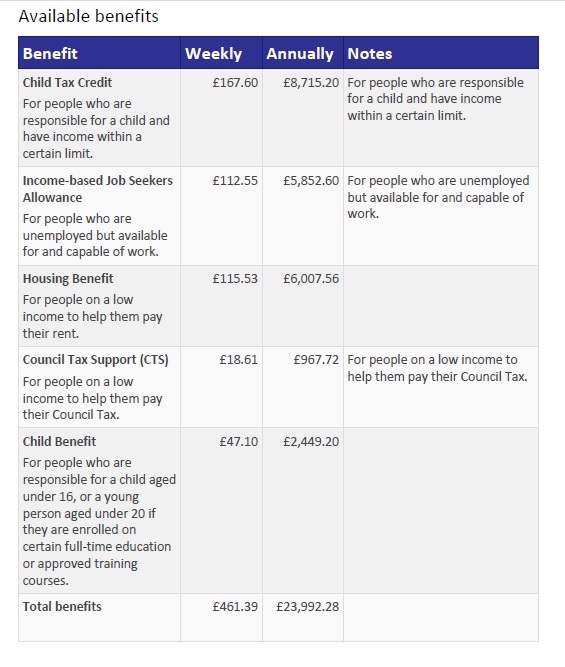 Please see Exhibit A. It’s a part of the benefits breakdown from Scenario 2, our family on benefits. As you can see, by the big red ring I’ve drawn round it, Housing and Council Tax Benefits are INCLUDED in this family’s total amount of money for the year.That means that, just like the working family have to pay their £500 a month of rent from their total income of £33,822.88, the family on benefits have to pay their £500 a month rent from their total income of £23,922.28. I haven’t missed anything out, both have to pay the rent.